You don’t see the term “Action Plan” being used around so much nowadays, unless you’re going to a junior school where this powerful template is used to teach young students the first steps towards how-to run a project. If you go to many charity or organisational websites you will also find pages dedicated to action plans for a cause. 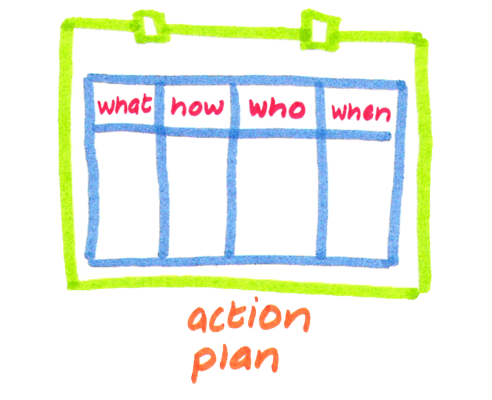 Action Plans are a major component of many corporate plans and strategies, particularly within the Project Management fields, as they basically include most of the resources or elements you need to have strategised to get a series of tasks done (the what)– the order of the tasks (the how), dates due (the when) and who by ( the who). Simply put, actions plans are lists of all the tasks you need to finish to meet an objective or goal. They are different from to-do lists, in that they list tasks for only one goal – to-do lists tend to capture several goals for the day. At a small scale planning level, action plans can also achieve prioritisation or ordering and dependencies between tasks – which tasks must be done first to allow others to be done. Taken out visually to tools like spreadsheets or MS Project, the action plan becomes a project plan and gantt chart. These tasks then become inputs to planners and schedules (and yes, onto a to-do list). Tip: If you’re after some project planning apps for the iPAD, I featured some in a recent #52Tech post. 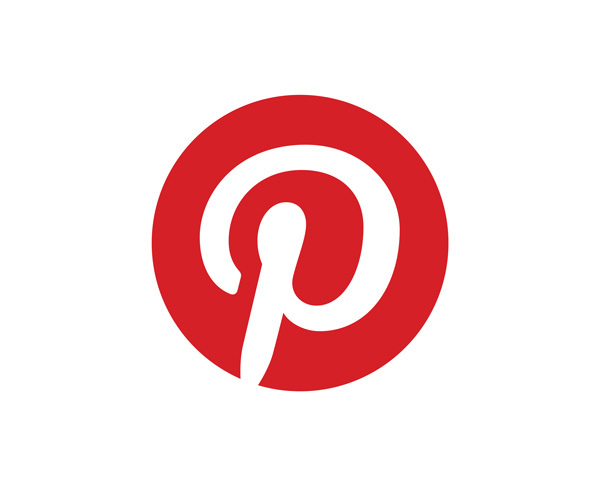 The past few productivity posts have featured everything from the need to chunk down tasks (or elephant bites), action planning, and featured plan and strategy templates. A post also discussed SMART goals. If you haven’t already got some kind of action plan for a major goal, here’s your chance to identify and break one down. Chunk the elephant (a vision goal) down into manageable bites or sub-goals (milestones). Use the SMART system to drill down into details of when you plan to have that milestone or sub-goal done by. Take that goal down to smaller steps or tasks. Assign priorities, resources and dates etc. Finally, include in your plan of attack some areas where you change focus on the project – review your goal at a higher level to remind yourself what you’re aiming for. 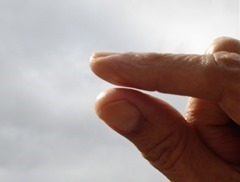 It’s time to get really small, and look at several productivity concepts which help to derive small actionable tasks from larger plans, and also know when to do these. Note – MIT can stand for the Massachusetts Institute of Technology, which does have a large area of expertise towards productivity, but isn’t the MIT being featured here. In productivity terms, although the concept is not original, MIT as a term is most often credited to Leo Babauta of Zenhabits, with his explanation often linked to. MIT simply stands for “Most Important Task” – and general practitioners choose only up to three MITs for a day to work on. That’s right – only choose three tasks, and focus on working on them to completion – one by one. For more, see Scott’s develop good habits website. For more on permutations of this 3-task choice, see next week’s Time Management post. “I have a two-minute rule that says: If you determine an action can be done in two minutes, you actually should do it right then because it’ll take longer to organize it and review it than it would be to actually finish it the first time you notice it”. You can DO it by taking action now yourself. You can DELEGATE it to someone else who is better qualified or has the bandwidth. You can DEFER (or schedule) it to do later. You can FILE it for later reference. You can DELETE it and forget about it. These five options are very similar to those used in the Zero Inbox method discussed in tomorrow’s post. For those tasks which appear to be able to be done quickly, the obvious choice is to do so. Dr B.J. 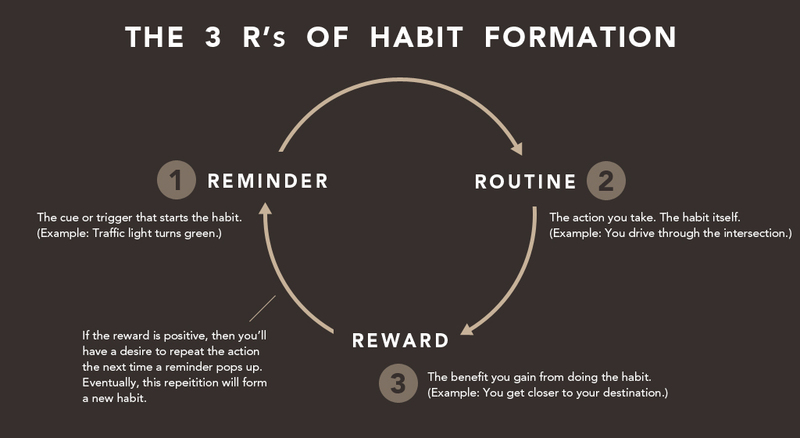 Fogg, PhD, a social scientist and behaviour researcher at Stanford University, administers the free Tiny Habits system. The system works with setting incredibly small tasks or habits with an anchor, and celebration. Using behavioural science, the course works to teach people how to set new habits with very small tasks or actions. Failure, and the learnings from it, are also a key component of the course. After I _______________[trigger], I will _____[tiny habit action, and celebration]. Fogg oversees participants in the course which runs over a week. TinyHabits.com. Signup is free. Leo Babutua at Zen Habits, talks about MITs for purposing your day. SJ Scott of Develop Good Habits often references MITs (and habits) in his kindle books. Zen Habits post on Action Habits lists ten questions designed to help you take action. 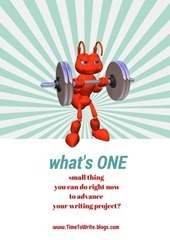 Time to Write posted a series based on the above Zen Habits questions – Nine Questions to get you writing more (this one takes you to the first – small actions) formulated for writers. More from BJ Fogg – the Behaviour Grid Tool. Success Magazine interviews David Allen on the 2 minute rule. There are several books on tiny habit or tiny task systems. These are not BJ Fogg’s books, but may be worthwhile pursuing – here’s a search through Amazon, with top of the list – Mini Habits by Stephen Guise. Michael Hyatt’s post (linked to above) lists 7 Habit or Goal tracking apps. Lifehacker – 5 Best Goal Tracking Services. Mentioned in the above posts are apps: Nozbe, GoalsOnTrack, LifeTick, Strides, Lift, Habit List, irunurun, HabitClock, OptimizeMe, Reporter App, SCCA Do One Thing, WriteChain, Write on Track, Word Track App, HabitRPG, Caroline and Young Mem:o, Joe’s Goals, 43 Things, Way of Life, stickK, Goalscape, Mindbloom Life Game and The Habit Factor. Also – check out the #52Tech post on Standards, an analog-digital hybrid for task habit management. Try out at least one of these systems – use the 2 minute rule for any new tasks which may come through your inbox and for those that only take a couple of minutes – do them; set only 1-2 MITs for your work session, or enrol in the next Tiny Habits course to try to set a new creative habit (like starting to write everyday – hint: the Tiny Habit firstly will be something like – “Sit down at the desk” and that is all). Hi, I noticed that you wrote about GTD in this great post that seems to combine a lot of strategies for productivity. I went to a GTD course and wrote up a summary, the materials and exercises afterwards as a blog post. Have a look, if you want. Really enjoyed this post, thank you! Thank you, Josefine, that’s perfect timing. Many of the upcoming posts have portions of GTD aspects, and on the next Tuesday there’s a full post on GTD, although I won’t be going over any aspects already covered in other posts. I hope anyone reading this will have a look at your links also, and I’ll be adding yours to my GTD post. Sweet! Thank you! 😀 Can’t wait to read it!